I’ve been looking forward to this one since it was announced. Unlike many cult horror flicks that most fans would deem untouchable (TCM, Evil Dead, ANOES, etc) the original “Silent Night, Deadly Night” had a lot of room for improvement. I mean, for a low budget horror movie about a killer Santa Claus it’s not terrible (especially compared to some others), but it’s not like it’s an amazing flick or something. The remake has a pretty good cast, including Malcolm McDowell (A Clockwork Orange, Halloween), Jaime King (Mother’s Day, MBV3D), Donal Logue (The Tao of Steve, Shark Night 3D) and Ellen Wong (Scott Pilgrim vs the World). Most of them are pretty good (McDowell has an in and out accent and chews the scenery like a juicy steak) but the rest of the cast is suspect. We don’t watch this stuff for the acting though, so I can’t completely fault them for that. 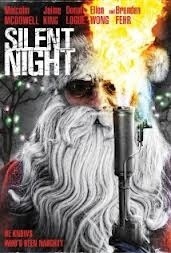 I must say that “Silent Night” is shot pretty well for a low budget horror remake (or any low budget horror flick I suppose), especially the largely black and white flashback scene. The kills aren’t always in your face and director Steven Miller (Automaton Transfusion) actually achieves some suspense and tension at times. That said, the movie isn’t great. I know, I know, shocking. I will say that it’s more entertaining than the original. It’s also better acted, has better kills and is better looking. I suppose my expectations were somewhat high going in, and there is certainly a lot to like here (especially for a Killer Santa flick). It gets gorier as it goes along, including a (literally) stomach churning woodchipper scene. In the end, you know what kind of movie this is. There’s some laughs, some pretty good kills, it looks good (more or less) and it’s (partly) well acted. 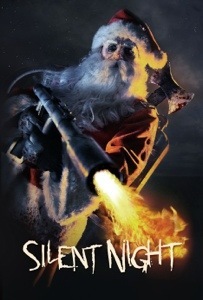 I can’t recommend it as a straight up horror recommendation, though it’s probably one of the better Killer Santa flicks I’ve seen, that’s not really much of an accolade. However, if you want to shut your brain off and watch a reasonably well done Christmas Horror remake, you could certainly do a lot worse. 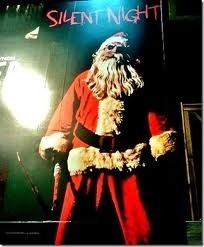 This entry was posted in Reviews and tagged 2012, axe, blood, Christmas, deadly, death, December, gore, guts, Halloween, holiday, Horror, killer, lights, murder, mystery, night, Remake, review, Santa, silent, slasher, woodchipper, Xmas by lazron. Bookmark the permalink.